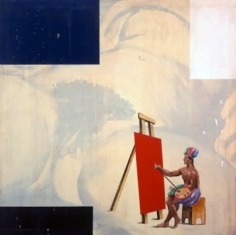 During April and May the George Adams Gallery will exhibit new paintings and drawings by Enrique Chagoya. 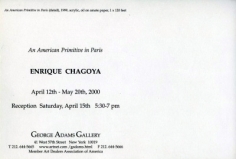 An American Primitive in Paris, Chagoya's first exhibition with the gallery, includes 11 works on paper and canvas from a series the artist began while on a fellowship in France this past fall. 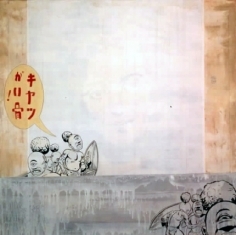 As suggested by the title, the exhibition's perspective is ironic - as Chagoya puts it, "Modernism in reverse". 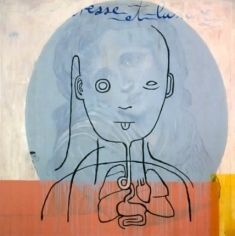 Where once artists such as Picasso and Brancusi appropriated imagery from non-Western cultures, now it is the artist from the New World (Chagoya was born in Mexico and currently lives in California) who has mined European culture in search of images to appropriate. The central work in the show is a large codex measuring 12 x 120 inches that gives the exhibition it's title. 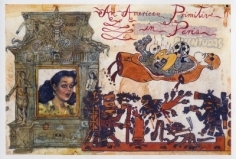 An American Primitive in Paris is formatted after the books (codecii) of the Meso-Americans and consists of ten pages of images running from right to left that represent both the New and the Old Worlds. Each page presents an often complex association of images that include, for example, views of the Americas by the 17th Century Dutch explorer Theodore Debry, Che Guevera, the Marx Brothers, Claude Monet, and characters from French and Mexican comic strips. Also included in the exhibition is a series of four canvasses in which images of Meso-Americans (Savages as rendered by Debry) appear along with icons of French culture. 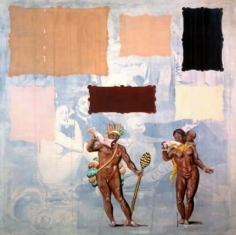 For example, in An Object at the Limit of Language two cannibals are depicted superimposed over Manet's Dejeuner Sur l'Herbe, while in Two Origins of the World the image of an Indian painting at an easel is juxtaposed over Courbet's Origins of the World. There is also a large-scale drawing, L'Arbre Geneologique(Family Tree), a mixed media work on amate paper illustrating a fictional genealogy that establishes a blood tie between contemporary French chic and the Nahua of Meso-America. 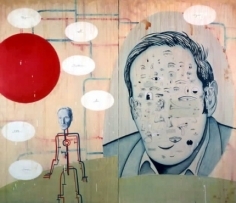 There is also a large diptych, Double Portrait of William Burroughs inspired by Chagoya's reading of Naked Lunch, as well as four small drawings on found book pages. 12 x 120 x 5"